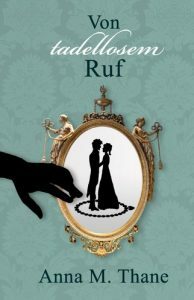 Most Regency Enthusiasts dream of owning 18th-century furniture. Alas! antiques are hardly within budget. So why not make your own antique-looking furniture? 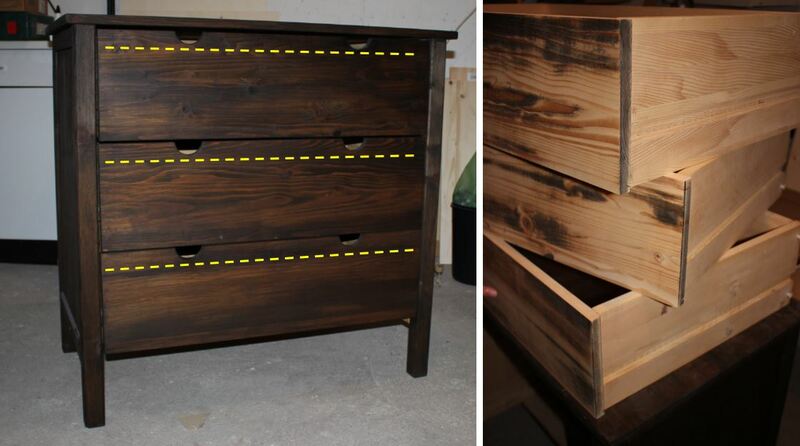 A Georgian-looking chest of drawers is within reach if you have some woodworking skills. Mind you, making antique-looking furniture is not about forging antiques. It’s just about creating a light 18th-century touch for your living room. You can, of course, start from scratch and build everything from timber yourself. However, there might also be the possibility to work with an existing piece of furniture in your house. 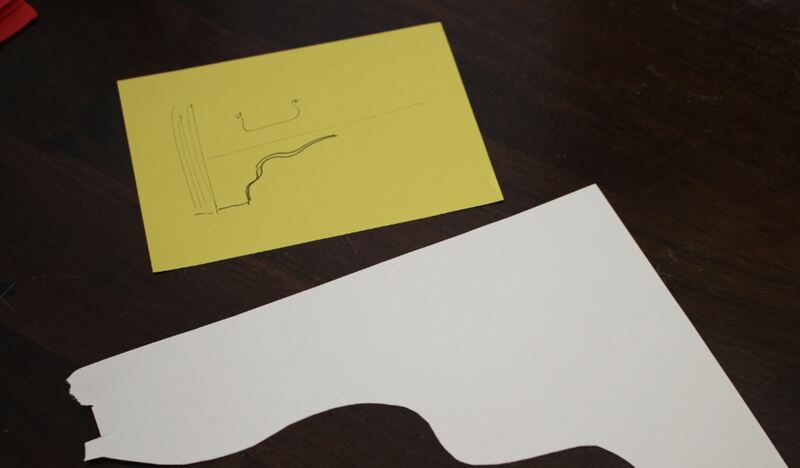 I happen to have a plain old IKEA “thing” which originally looked like the one in the photo (left side). In a previous effort to make it look more respectable, I had applied some brown stain. I quite liked it, and it had served in my apartment as a linen chest. 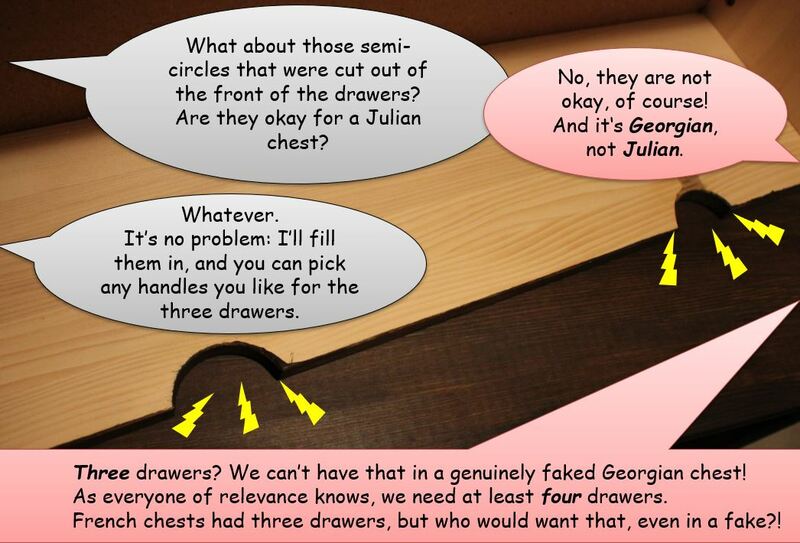 But once the idea of making a Georgian chest of drawers was born, I felt the chest would be a good basis to work with. I asked a friend with woodworking skills for assistance. 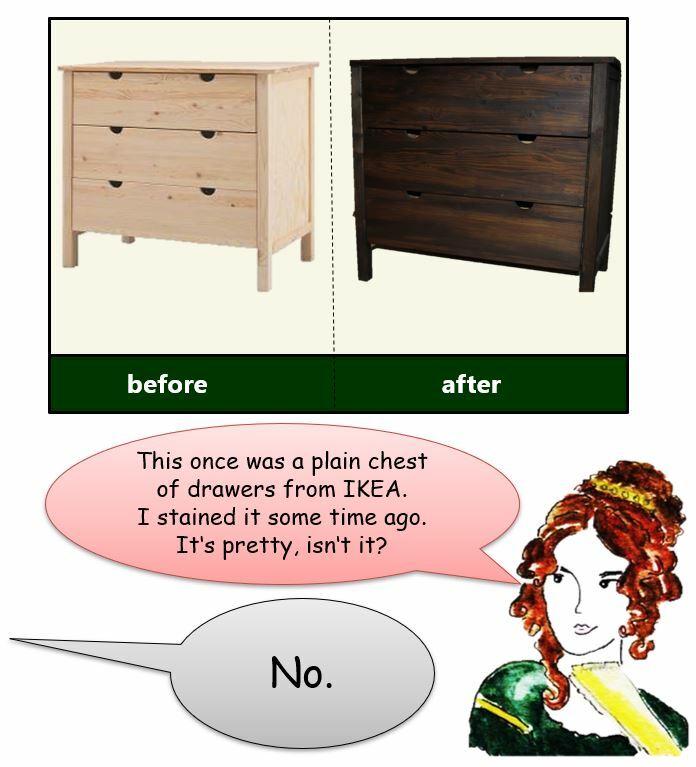 One cannot help but notice that the original IKEA chest has three drawers. That’s a problem! British Georgian chests of drawers used to have at least four drawers. 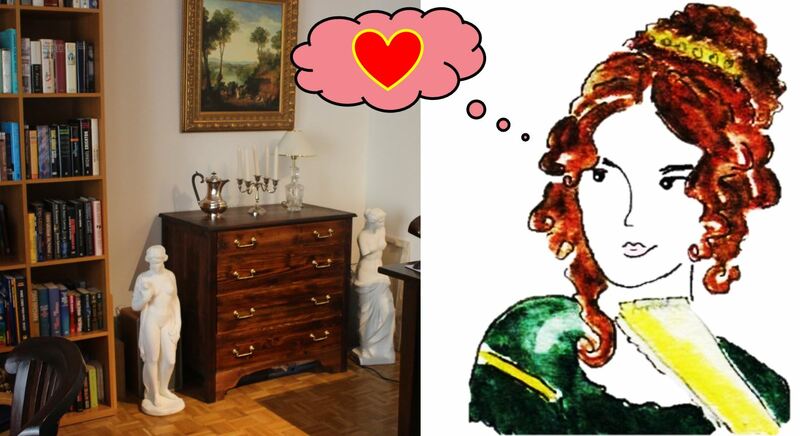 Three drawers were the mark of a chest of drawers made in the French style. My friend cut the top off the top of front parts, so that a complete rectangular front remained. This made room for the fourth drawer. The side boards of each drawer, now too high for the new front parts, had to be adjusted, too. 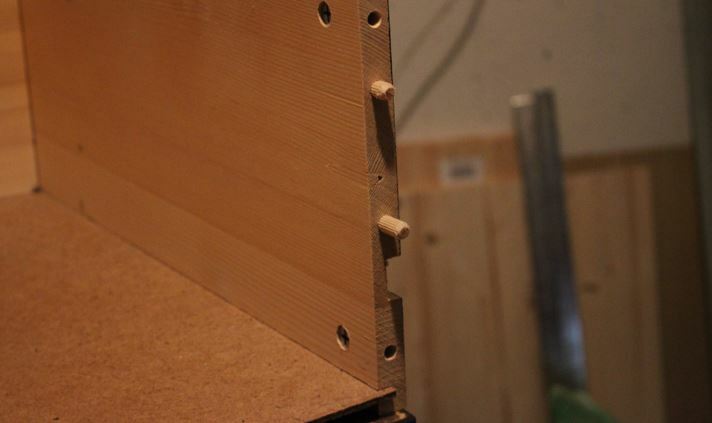 It would have been historically correct to have a dovetail-fixing for the boards of the drawers, but that is not what you find in your average IKEA product. The existing dowels were kept and new ones were used where necessary. The wood was cut accordingly and fixed to the chest. An ogee shape was also used for the ornate edge of the top. 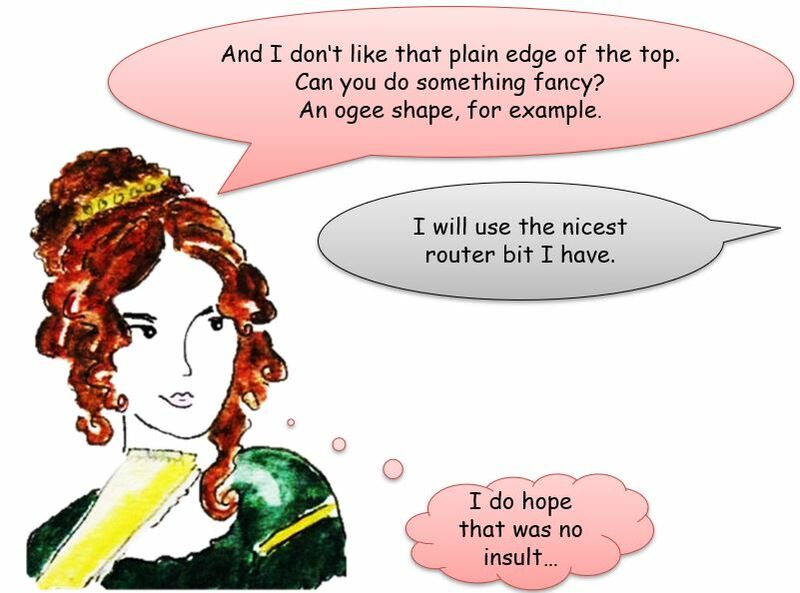 This was done with a router (I was told). My friend set off to work. A Georgian chest of drawers had dustboards between the drawers to keep its content save from, well, dust. 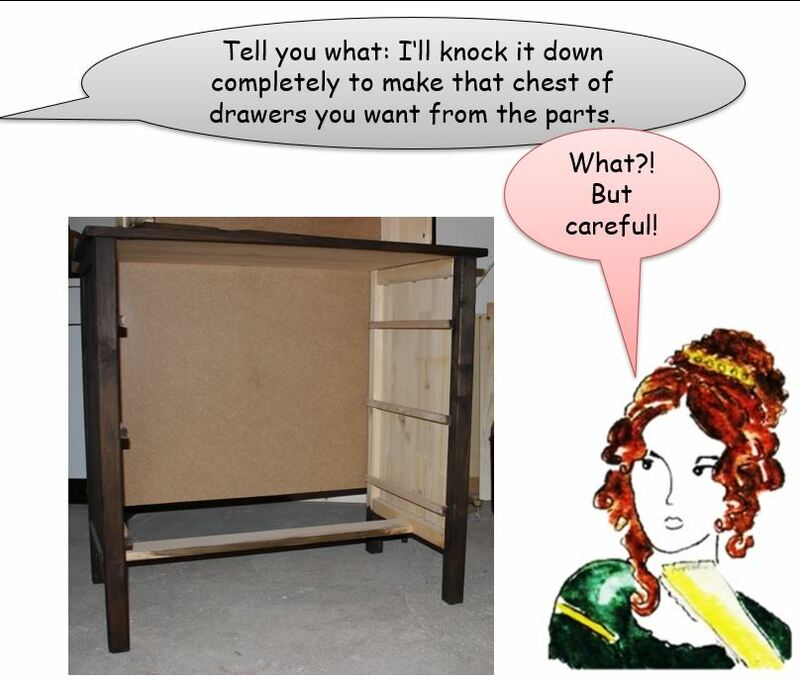 The height of the new top drawer resulted from what was taken off of the three existing drawers – adding dust boards would reduce its height again, though. But it is unacceptable not to have dustboards. 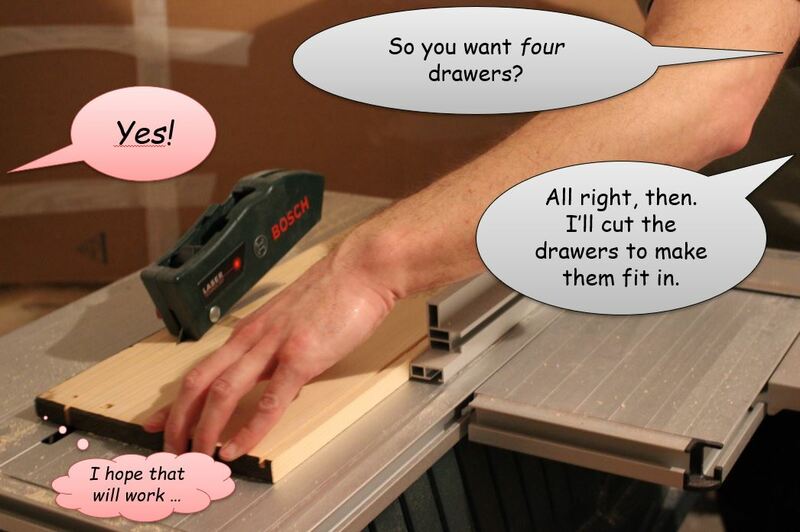 We actually faked the fake dustboards with simple strips of wood between the drawers. Georgian chests of drawers were often made of Mahogany wood imported from the West Indies. We shouldn’t use this rare wood today. The IKEA chest is made of pine, a soft wood, easy to work with. The old stain was partially removed, leaving some of it to give it more “age”. Then a new stain of Mahogany red was applied. To add protection and shine, a finish of several layers of linseed oil and also a layer of wax were added. The original IKEA chest had two semi-circles cut into each drawer – a modern approach of the handle. This won’t do for a Georgian chest of drawers. I searched the web for handles in 18th-century style and within budget. I wanted two handles for each drawer to create the symmetry essential in a piece of furniture of the age. I finally found the handles, but their colour – described in the online shop as “bronze” – turned out to be an uninspiring brown. I used gold spray for a new coat of colour and some extra shine. A huge thanks to my woodworking friend for creating this lovely piece!